is located on the Irrawaddy River in the hill country 365 miles north of Rangoon. An important trade center with railroad and riverboat connections, Mandalay was the last imperial capital of Burma and a religious center for Buddhists. The British built Fort Dufferin around the former imperial palaces and Burma's first tram system, which opened on June 17, 1904. 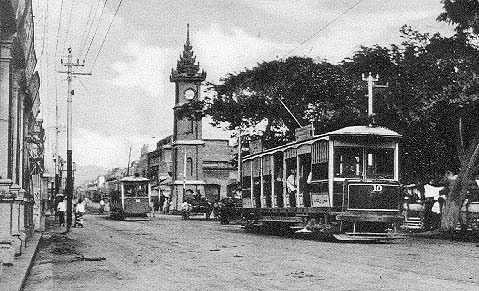 By 1921 there were 11 km of track and 24 trams in operation. The system closed during World War II. This postcard shows trams on one of the three routes that met at the clock tower in the center of town. is the capital, commercial center and principal seaport of Burma. Site of an ancient Buddhist shrine, the gold-covered Shwe Dagon Pagoda, the area was occupied by the British in 1824 and became Burma's capital in 1852. The British built large public buildings, parks and gardens and opened a system of steam tramways in 1884. An electric tram system followed on Dec. 15, 1906, and by 1921 there were 22 km of track and 77 cars in operation. Japanese air raids destroyed the power plant during World War II. 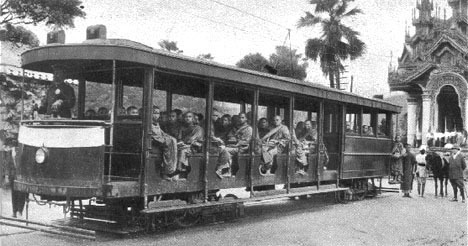 The postcard shows Buddhist monks setting out on a tram to collect alms. Another card in this series shows their return.